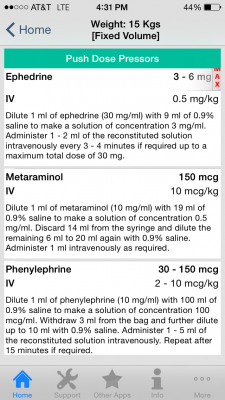 My first experience with the use of push dose pressors in place of a continuous drip came during my Anesthesia rotation. A patient in the OR had become mildly hypotensive after the general anesthesia was administered. 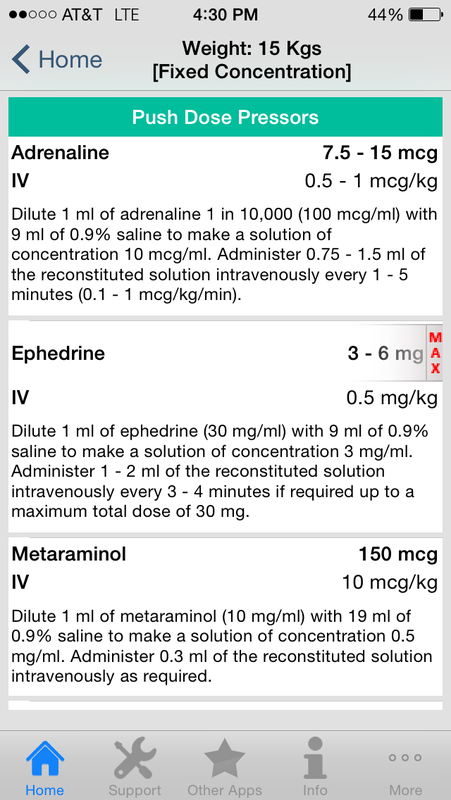 In response the Anesthesiologist immediately administered a bolus of ephedrine and within a minute the patient’s blood pressure returned to an appropriate level. Anesthesiologists have been using the concept of “push dose pressors” for years and it is not until recently that its popularity has spread among Emergency Medicine and Critical Care physicians. 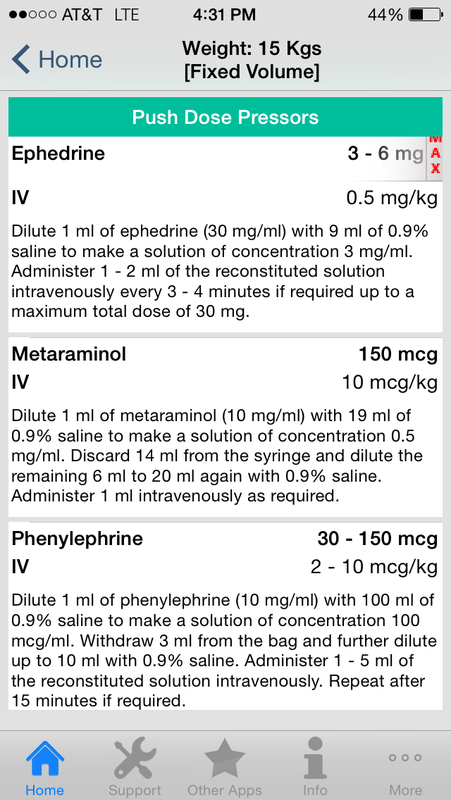 Push dose pressors provide a fantastic, quick measure to stabilize a hypotensive patient whether it’s for transient hypotension (ex. 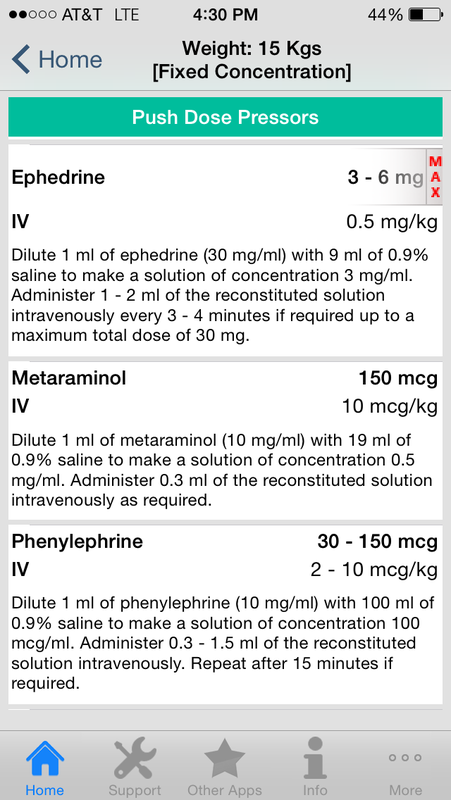 post-sedation) or used as a bridge for a patient needing a drip. 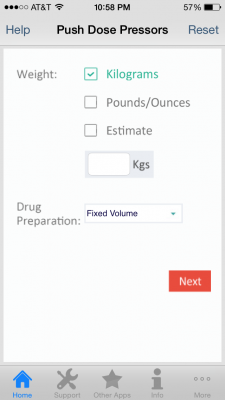 The developers at ITDCS have created an app, Push Dose Pressors, to help physicians titrate pressors based on weight that can subsequently be given as boluses to critically ill children and adults. Providers can choose between the following pressors – epinephrine, ephedrine, metaraminol, and phenylephrine – at either a fixed concentration or a fixed volume. On the home screen the user has the option to enter the patient weight or for children can find a weight estimate using their age through the Advanced Pediatric Life Support (APLS) formula. After entering the weight, the user can then choose preference of drug preparation – fixed volume or fixed concentration. 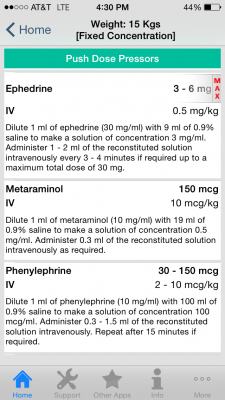 With a fixed volume preparation the dosage will vary based on weight. 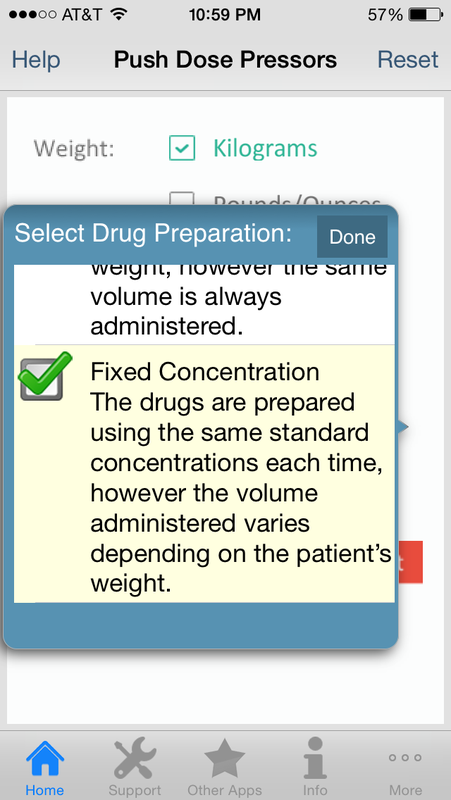 Detailed instructions on how to formulate the appropriate pressor concentration along with the rate at which it should be administered are provided. 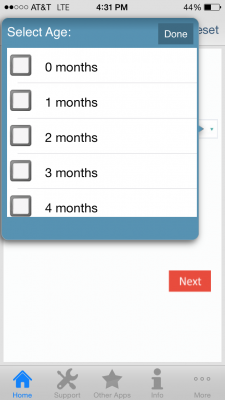 Who would benefit from the app? 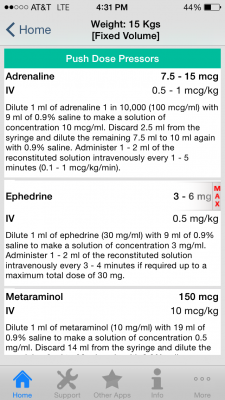 Push Dose Pressor is a handy app for any health care providers treating critically ill patients, especially the pediatric population where weight-based dosing is key. It provides convenient instructions on preparing appropriate pressor doses and at what rate they should be given. 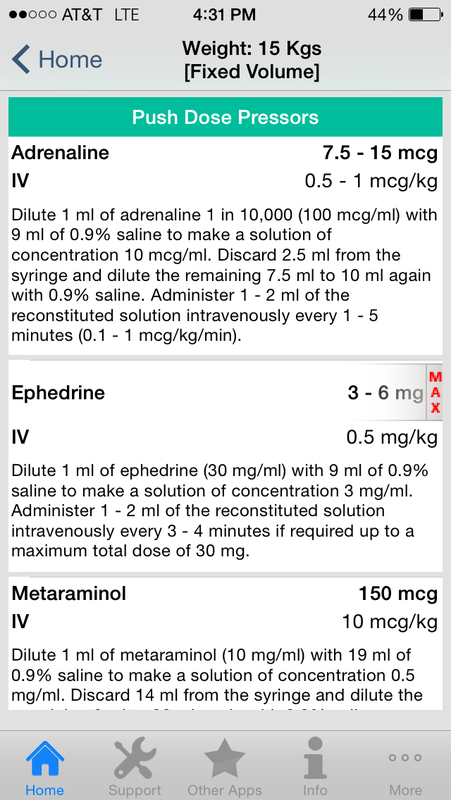 Knowing how to prepare a push dose can greatly help an unstable patient who is in a transient state of hypotension or in need of a pressor while central access for a drip is being established. Unfortunately the developers of the app do not provide any academic sources from where the pressor concentrations and rates were formulated. 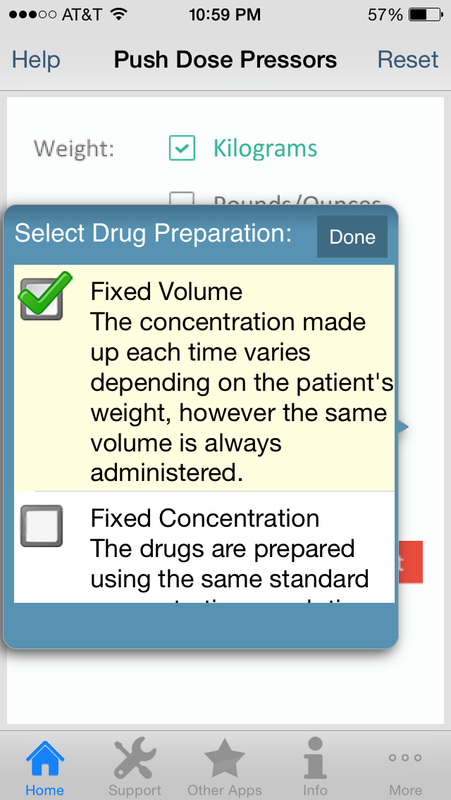 So our final conclusion for this app is that you should verify the dosing yourself independently before utilizing this app as we are unable to confirm the validity of the measurements or how the developers came up with them. Basic design. Easy to use and quick navigation. Limited. Could benefit from videos showing how to mix the push doses. 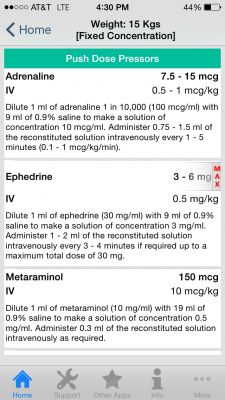 Can be useful to any health care professional treating critically ill adults and children.